rebecca likes nails: 500 follower giveaway winner! Before I announce the winner I just want to say a big thank you to all of you for entering. I can't believe I'm only 9 followers away from 900. And I've only been doing this for 5 months! It's really crazy. I guess it's time to start planning my 1000 followers giveaway! Haha. Now, in this giveaway I had 451 individual people enter, plus 190 facebook fans who all got an entry. Including all the second, third, and fourth entries that some people got, there was a total of 1203 entries! That's a lot! I remember when I was making my sheet with all the names I thought "666, that's gonna be unlucky!" And then 665 was the winner. Haha! I've already contacted Natalie and she has responded! Later today I'm going to post the results of the question I asked in my form - What's your favorite nail polish? It interests me to see what people have said so hopefully it interests you too! Oh, and I have a tip for your own giveaways. About halfway through this giveaway I saw a MUCH better idea for adding in second/third/etc entries. Instead of typing them all up as I did above, you add them into the spreadsheet you get on Google Docs. You type the entries that person has into the next free cell. Of course this only works if you've used a form. I started doing this around entry 700 and it went soooooo much faster than typing them all out. I got this idea from Polish Infatuated. 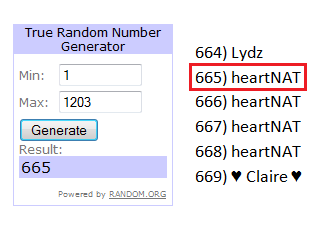 When she announced her giveaway winner she showed a part of her spreadsheet and I saw that and said "EUREKA!" Lol, that is a good idea! That's what I'm doing for my next giveaway. Congratulations to the winner! Congrats to the winner! :) that was sooo close! hello kitty shoes. and hello kitty mani. i am loopy. froot loopy! 24 hours left for my giveaway! 5 days left to enter my giveaway! Gosh - Holographic - swatch and review and video! rebecca likes nails is on facebook!